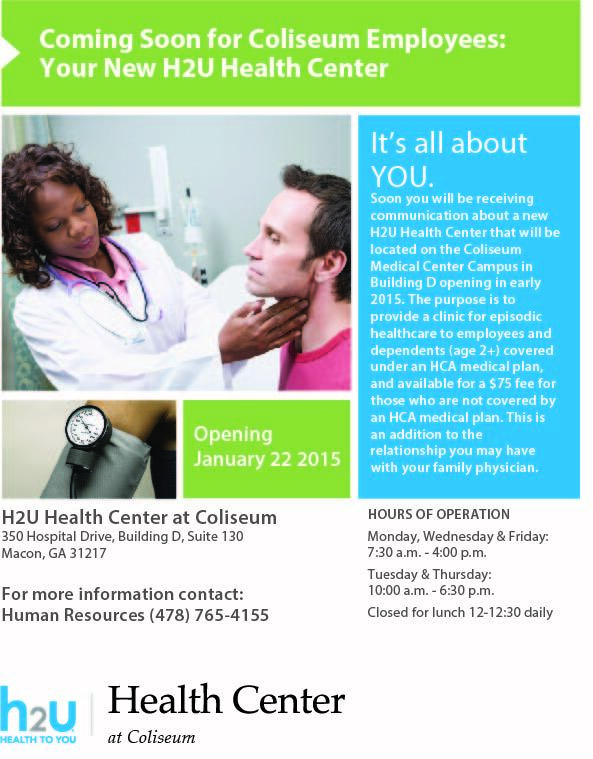 H2U Health Center Opens January 22nd! This entry was posted on January 13, 2015, in HR. Bookmark the permalink. This is a health center for ALL Coliseum staff AND their dependents (ages 2+)! If you are covered under an HCA medical plan, your visits are free! If you are NOT covered under an HCA medical plan, you will have a $75 co-pay fee. Monday, Wednesday, & Friday: 7:30 a.m. – 4:00 p.m.
Tuesday & Thursday: 10:00 a.m. – 6:30 p.m.
More details to come! Keep checking the blog for updates!